Recently ordained, Fr. Damien grew up in Singapore in a traditional Chinese family. 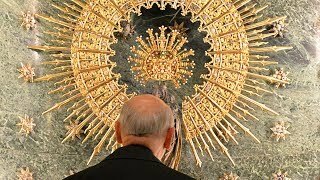 In this video and in the interview below, he talks about how he discovered the "living God" of Catholicism. How did you get in touch with Opus Dei and how has Opus Dei changed your life especially in your previous professional life? Allow me start with the story of my family. My father was a refugee from Southern China during the Second World War. He married my mum and settled down in Singapore. My parents are "traditional Chinese" which more often than not means non-Christians. I still have fond memories of my mother frequenting Taoist and Buddhist temples especially during the school examinations period to pray for her five children. I used to visit these places of worship myself since my father had a fruit business and his clientele included several Taoist temples. My first contact with the Catholic faith was when my brother, Aloysius, returned home from primary school one day and told me in a grave tone, before the earth deity on our family altar: "My classmate Josephine told me that her God is a living God." It left a strong impression on both of us. A living God whom we can actually speak to? Years later, Aloysius met a good Catholic friend in military service and got baptized. He began bringing home Catholic reading material and I soon got interested. I remember spending my military service reading a good number of books about the Catholic faith, one of the authors was St. Josemaria Escriva. Soon, I decided that I wanted to acquire the "third dimension" which he spoke of in point 279 of The Way. I started catechism classes in a center of Opus Dei, got baptized and joined Opus Dei as a numerary in my sophomore year of university. How has Opus Dei changed my life? A great deal. And God willing, I hope it continues to change my life for the better. As a popular Chinese saying goes: "Time and Events make Heroes." I think St. Josemaria would agree that we can apply this popular wisdom to our daily lives - EVERY moment and EVERY circumstance is an occasion for heroic living, to realize that God our Father is very interested in our humdrum ordinary lives. We do not have to wait for extraordinary events like earthquakes and tsunamis to recall that God exists. As it turns out, the living God is a fatherly God. My parents respected my decision to join Opus Dei as a numerary, but being non-Christians, they had difficulty understanding it. A sort of uneasy acceptance loomed over our relationship for many years -- a tension which I didn't know how to resolve. But less than a month before my father died, both of my parents were baptized Catholic. I saw that as a gift from our Father God for the trial of uncertainty about my vocation that they went through. I am still dumb-founded today whenever I recall the baptism of my parents. Even today, God's saving power has not diminished. What are the challenges a priest faces in our modern era? I would definitely like to have a good numbers of years of priestly experience under my belt before answering this one! It is not an easy period to live the priesthood but I think we have many good testimonies of priesthood around us. The two extraordinary witnesses of priesthood are: Blessed John Paul II and Pope Benedict XVI. I attended the Beatification of John Paul II some days ago and I was struck by the devotion of the pilgrims, how prayerfully they attended the Beatification Mass. At St. Peter’s Square, I saw video images of John Paul II when he was young and handsome and how he charmed massive crowds with his powerful words and personality. But I think the testimony of Blessed John Paul II in his old age was even more eloquent. Many of us would call in sick for work when we are stricken by a cold. Well, the Pope still had to appear before millions of people with his debilitating Alzheimer's disease. Something especially trying for someone who was once an actor and a poet. It takes lots of faith and courage to publicly manifest one's weaknesses - all for the sake of doing God's will. Now all of us know that when he was still Cardinal Ratzinger, the present pope’s dreams of retirement to writing books were dashed when he became Pope Benedict XVI. In an age when young people are already saving for their retirement, the Pope has given us a wonderful example of how we should seek to serve God first and trust in his fatherly divine providence. I am also amazed by his frankness in his inaugural speech: he said that he did not have a master-plan for his pontificate -- he just wanted to God's will. Both men did not only do their best -- they gave themselves to follow Christ. Priests are very fortunate to have these two eloquent testimonies of faith. How would you confront those challenges? To deepen my awareness that "the living God is a fatherly God." To draw strength from the Eucharist. To confess my sins better in the wonderful Sacrament of Mercy. To count on the prayers of the Church -- which means your prayers for us priests!